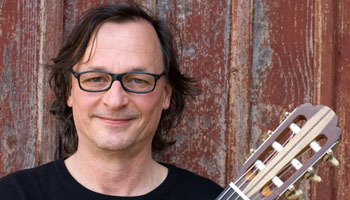 Stefan Barcsay is a renowned guitarist, born in Würzburg. He discovered his passion for music in his early youth and studied music (guitar) at the HdK in Berlin. He teaches at the vocational school for music in Krumbach/ Schwaben where he coaches students to become professional musicians. Besides the classical repertoire, he is devoted to contemporary music. He cooperated with various composers like Enjott Schneider, Alois Bröder, Ulrich Schultheiss, Larisa Vrhunc, Stephan Marc Schneider, Dominik Uhrmacher, Joachim F. W. Schneider, Hubert Hoche, Richard Heller, Stefan Blum, Erich S. Hermann, Toni Völker. Furthermore, he is responsible for the first release of their music and the corresponding CDs, for instance two CDs with chamber music and four solo guitar CDs. Additionally, he published the project “Children’s Corner”, printed by Polymnia Press, as well as the compositions “3 Nocturnes” and “Obscuritas” from Enjott Schneider, printed by Schott. Moreover, Stefan Barcsay is releasing projects where he combines different kinds of art, for example, concerts including writers and speakers (Heiko Michael Hartmann, Michael Kaeuffer) as well as painters (Andi Schmitt, Jürgen Roesner, Michael Runschke, Norbert Rösner) and other musicians (Mathias Dittmann (flute), Silke Kaiser (soprano), Michael Grill (organ), Peter Bader (organ)).